DMR-0820404 Q. Wu, J. P. Turpin, & D. H. Werner, Light: Science & Applications, 2012. Using the new tools of metamaterials and transformation optics, MRSEC researchers have developed designs for miniaturized optical devices in chip-based optical integrated circuits, the analog of the integrated electronic circuits in computers and cell phones. A unified theory for designing practical devices on a single platform using transformation optics has been developed. These broadband, lossless all-dielectric-based gradient-index devices designed include beam collimators, beam splitters, waveguide crossings and waveguide couplers. 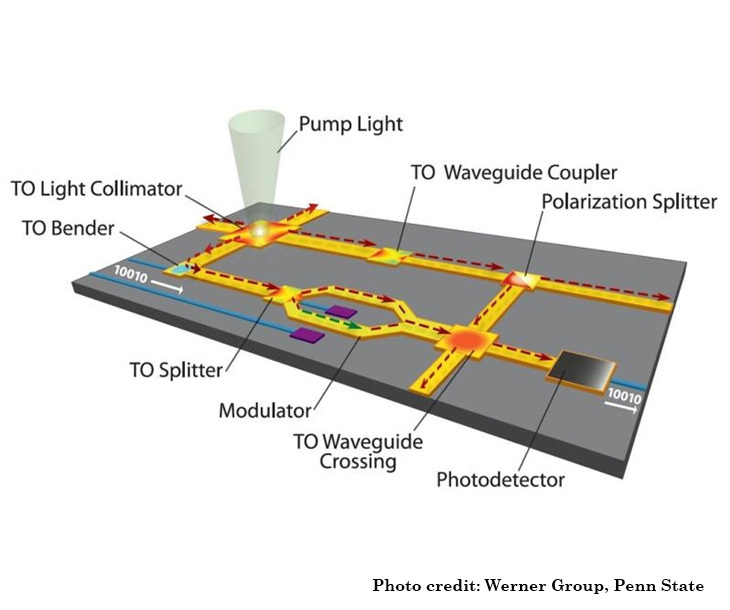 This technique provides a pathway to broadband, low-loss integrated photonic systems: circuits for light.